In the early morning daylight of a perfect spring day, with the fog rising off the clear, cold water and the strange hoarse cries of the blue heron sounding eerily from it, and the trout just waiting to see your fly or bait hit the water, well, surely for any fisherman, a day like this is about as close to heaven as you can get in this life. And, for any fisherman who's ever had such a day on the White River the memories are a treasure to unpack and savor when winter snows confine. That's how the White River became a legend. That's why folks come here from all over the world to share the experience. They may tell you it's because of the size of the trout, but that's not all they talk about when this glorious Ozark river comes back to mind. Instead, they'll talk about how the fish taste cleaned on the spot and slapped into a frying pan on the river bank. Or where "Liar's Rock" is. Every campground has one - the place where the fishermen gather in the evening to tell the stories of the one that got away. Or, what it's like to grab your chair, pole, tackle box and lantern and make your way to the river before daylight, filling up your stringer long before you can see the fish you hear jumping. Or how bright, and fast, and cold, the clear water was as their john boat pushed upstream against its mighty flow. The White starts, like the other Crown Jewels of the Ozarks, in the rugged mountains near where all the others begin. It looks a lot like them as it tumbles downward, clear and flashing and complete with rapids. Then, it can't seem to decide where it wants to go. It wanders west then turns back north towards the Fayetteville-Springdale area and finally turns east again, even sneaking over into Missouri before it turns southeast past Cotter, Calico Rock and Batesville. At last, at Newport, it makes a decision and heads directly south to flow 257 miles down to the Mississippi River. On the way, it feeds five lakes in Arkansas, Beaver, Table Rock, Bull Shoals, Norfork and Sequoyah, and two more in Missouri. Bull Shoals, the largest dam, is responsible for converting the river into one of the nation's premier trout fishing streams. The upper river, that first 31 miles, doesn't get a lot of attention, but it's prime floating when the water's good and the bass, catfish and sunfish are satisfying for any angler. Try spinner baits, crawfish imitators or minnows and other natural baits. In 1819, Henry Rowe Schoolcraft wrote about "the most imposing, diversified and delightful scenery" of this area of the river and the "remarkable transparency" of its water. 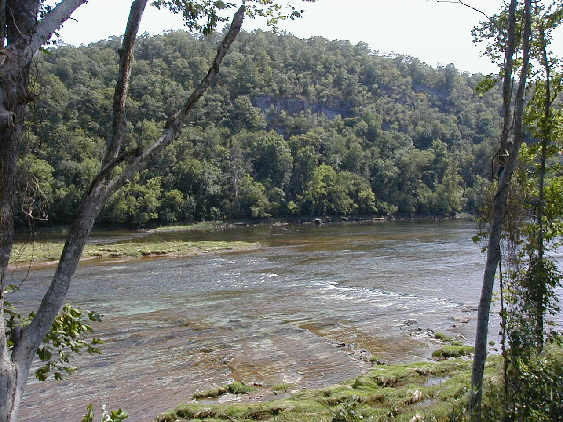 Below Bull Shoals, the Arkansas Game and Fish Commission stocks thousands of pounds of trout each year. Probably more rainbow trout are caught here then on any other trout stream in America and more then 90 percent are caught by anglers who came here to fish the White from all over the world. It isn't just rainbows, though. Check the numbers on some of the brown trout caught in the White. In 1972 a 31 pound 8 ounce monster brown took the world record title and held it until 1986 when Tony Salamon landed a 30 pound 8 ounce champion. You may never see one that big, but five and 10-pounders aren't uncommon and a few 20 plus pounders come out of the river every year. This still isn't the end. There's cutthroats, first stocked in 1983 and already reaching the 10 pound class, and brook trout, which are rare but have reached up to four pounds. With its international fame, the White has an almost endless list of access points, resorts, campgrounds, services and suppliers all along its length. In fact, solitude is not likely to be a White River experience, except on that uppermost 31 miles. It's floatable year around from below Bull Shoals Dam and some of the best fishing is in the winter months. The most common way to experience the White is to hire a guide and a john boat and head for a fishing hole. Because of power generation at the dam, water flow can vary greatly over a 24 hour period. At low water flow times, walking and wading along the bank is a viable fishing option. And, if trout fishing isn't your thing, remember that two of the nation's top smallmouth streams, Crooked Creek and the Buffalo River, are White tributaries. While outdoor writers tend to go into raptures over the fishing, hardly anyone talks about the scenic beauty of the White River. It's there. If you want photographic opportunities, icy-cold summer swimming, wildlife watching, or canoeing thrills, don't pass it up. A fascinating attraction of the area is the Norfork National Fish Hatchery. Other points of interest are the historic Wolf House and the White River National Wildlife Refuge.